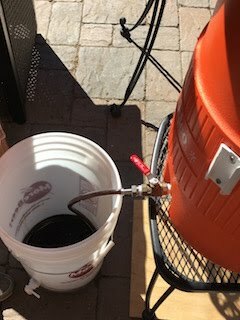 After being away from brewing for the birth of my daughter, I wanted to start using the mash tun, it was time to go past the steeping tea bag style. I had my friend comeover and help me out since it was the first attempt on my tun and I felt better having backup in case I needed it. I decided I wanted to make something porter-like. What I ended up with was a dark Brown Ale. It doesn't have the consistency of a porter, but is a lot like a brown with some black patent and chocolate malt. I did a 5 gallon batch with 5.5 lbs of grains and 3 lbs of malt extract. We got BeerTools setup for how hot the kettle needed to be, luckly my friend had the same gatorade-style plastic tun so I was able to copy his calibration details. All went well as we hit our target of 155°, stirred after 15mins, and was still within range a 1/2hr. 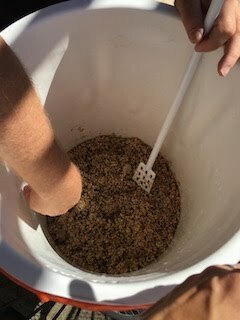 The biggest challenge of the brewing process was making sure not to sparge too much from the mash tun. With the sparge arm, we put some aluminum foil at the bottom to spread out the water better. As the wort got lighter and lighter, we stopped and started the boil. From that point on, it was pretty uneventful. Add a light amount of Northern Brewers hops for littering and cool down. The only part of this brew that frustrated me was that I looked at the White Labs label for the temperature to ferment. Seeing it says 70°-75° for the yeast, not realizing that was just to start fermentation. On the second day of fermentation, I had to add a blowoff tube as the yeast was going crazy. Then I realized my mistake and lowered the temperature to 66°. Never again am I going to look at that label. I was concerned I screwed it up and was going to get some off flavors. Luckily, because of it being a malty beer, there was nothing noticeable and the beer tasted really good and want I wanted. After a few beers of it I decided to I served it along with the next beer I brewed at my daughter's baptism party. So I couldn't drink too much as I had it in a 3 gallon keg, the rest were in bottles.